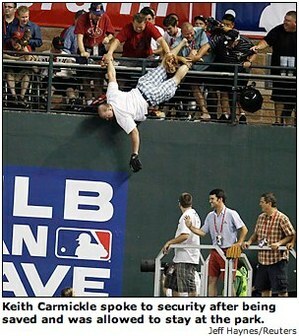 Chasing a home run hit by Milwaukee’s Prince Fielder, Carmickle was saved from a long fall when his brother and a friend grabbed him around the legs and arms, then pulled him back as he dangled above the deck area behind the pool in right field at Chase Field. Trying to snare a towering shot by Fielder, Carmickle stepped up onto a metal table about 18 inches wide and reached down to catch the ball. It hit a wall several feet below Carmickle. His momentum carried him forward, headfirst over a short railing at the back of the table. Some people really don’t learn lessons well. There’s been talk about making stadiums safer, but there’s really nothing you can do to eliminate stupidity. 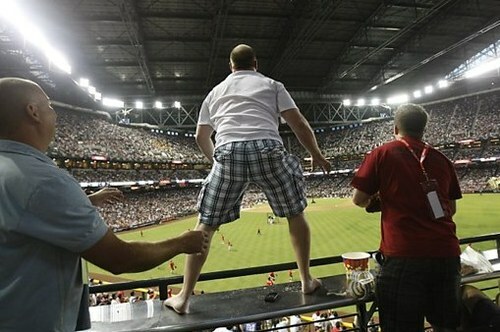 UPDATE: From SFGATE.com, here’s a picture of the dumbass, Keith Carmickle standing on the table waiting to catch a home run ball. this crap was staged. look at the pics, the guys holding him are laughing. this is about the most disrespectable thing I have seen. I hope the guys who did this are reading these comments. there is a little boy here in Texas that lost his father and for yall to think its funny or cute to act like you might fall is so wrong! too bad the ball park didnt kick you out for your actions!